Rats and mice can cause destruction to property and are also known for spreading diseases. Once they set up a nest and begin to breed, they can seem unstoppable. Many advocate home made remedies while other believe in the “catch and kill” method. We're here to help you make some sense of all the different suggestions and to find the most effective method. Some believe that because rodents have a heightened sense of smell, strong scents like naphthalene, peppermint oil or ammonia, will repel them and force them to look for a new environment. The truth is the opposite. Both Naphthalene and ammonia are harmful to kids and should not be left lying around your attic. Mice and rats ignore mothballs, and ammonia that smells like urine is a familiar scent to most animals. Peppermint oil might have a strong smell, but it dissipates very fast and therefore is not an effective deterrent. Naturally, cats and dogs will chase away the occasional mouse or rat, particularly when they are playing outdoors. But more often than not, the presence of a mouse in the house, especially in the kitchen when they can hide under the dishwasher or the refrigerator, will cause your pet distress and anxiety. They will sometimes stare for hours at the invisible rodent behind the wall and will become more irritable with time. Only rarely will the rat or mice in question will come out of hiding while the pet is lurking for it. Large rats can scare cats and even attack them. Many try first to use the simple bait and kill method, which often starts with a couple of accidentally pinched fingers, food stains all over, and the occasional dead mouse. Unfortunately, if you already have an infestation, using a couple of old fashion wooden traps will not help eliminate the problem. You will need to spread many single-catch traps all around your attic and house and even then it won't get rid of the problem simply somewhat mitigate it. The best way to catch rats and mice and to prevent them from infesting your attic and your home is to use professional, tried and trusted tools and methods to rodent proof the space. Our team uses non-lethal traps that can catch more than one mouse or rat at a time. In addition, we will locate and remove the nest, and then thoroughly clean and decontaminate the area and its surroundings, in order to ensure that no contaminated material is left behind. 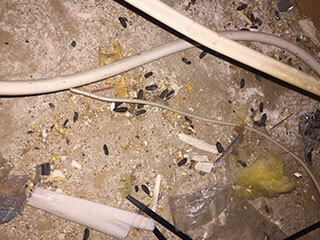 To prevent the infestation from reoccurring, we'll fill and patch over holes, cracks and nooks, and make sure debris left in your attic that can serve as potential nesting material are removed. Not only can it be incredibly annoying to have to deal with a rat or mouse in your house, if they start breeding and a full-blown infestation takes place, then the potential health hazards makes this a very dangerous scenario. Contact our team at Attic Cleaning Irvine to make sure your property is rodent proof and that any existing pests are thoroughly removed using safe and humane methods.